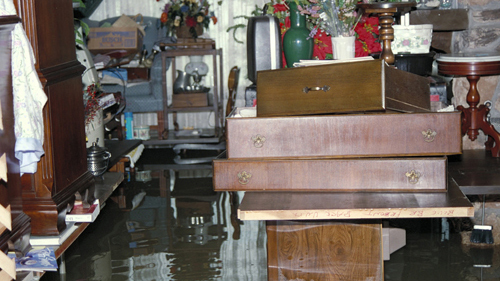 Basement flooding can happen quickly and unexpectedly. Being the lowest part of your home, the basement can take on water and flood first in case of any kind of water emergency or heavy rainfall. Basement flooding can cause severe damage to your property and possessions, and if not cleared up quickly and properly, the effects of it can become even more severe. With so much of Essex County being located close to the water, basement flooding in Windsor-Essex is a very real concern for many people living in this area. If you need help getting the water out of your basement and getting it cleaned out properly, call Hernandez Sanitation for assistance with your residential basement flooding in Windsor and Essex County. We know that basement flooding can cause a great deal of stress for you and your family. With residential basement flooding cleanup from Hernandez Sanitation, we can help take away some of that stress by quickly and effectively removing the water to help minimize the damage and getting your basement dry again. We know how important it is to get the water out as soon as possible, so you can count on Hernandez Sanitation to remove the flood water fast when you call us for basement flood cleanup in Windsor-Essex. We can also help reduce the chances of flooding and reduce how much water gets in, as well as helping to get the flood water out of your basement, with our sump pump repair services. If your sump pump isn’t working properly, it can result in more water sitting in your basement rather than being pulled away, leading to even more damage and a higher water level. Let our team of professionals service and repair your sump pump so it can work its best and help reduce the effects of basement flooding. To learn more about sump pump repair in Windsor-Essex, contact us today. At Hernandez Sanitation, we understand that basement flooding doesn’t always happen during regular business hours, and that you need help fast whenever a basement flooding emergency happens. That’s why we offer emergency after-hours service to help you with Windsor-Essex basement flooding. We are proud to serve all of Essex County, so whether you need us to help with a flooded basement in Tecumseh, Lakeshore, Kingsville, Leamington, or any other part of our region, we’re there to help. For more information on how Hernandez Sanitation can help you with basement flood cleanup in Windsor and Essex County, contact us today. We’re there to assist you with basement flooding, pipe repair, septic tank maintenance, and many more pipe and drain services for both commercial and residential customers. Call us at 519-738-3309 or contact us today to get started!